Hi, I am interested in your 1967 Chevrolet Chevelle SS (stock #5120-CHA) listed on Autotrader for $49,995. I'd like to get more information about this vehicle and confirm its availability. 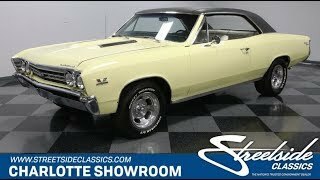 This is a real-deal 1967 Chevrolet Chevelle SS with a great vintage look. But as you dig deeper, you see a ton of upgrades that takes this from a cool hardtop classic to a street-eating big block machine. Butternut Yellow is one of those defining colors for the Super Sport Chevys. Vivid yet innocent, it made these high horsepower cars feel unassuming - but they left an impression as they showed everyone their taillights. And thats exactly what this one was built to do. After all, not everyone is going to spot the extra meaty rear tires on these classic-style slotted mag wheels. They signal theres extra performance in this Super Sport. Still, most peoples first impression is a well-preserved Chevelle SS. The light paint makes for a great contrast to the darker features like the SS grille, blacked-out rear panel, and premium vinyl top. Plus, as a true classic American, you get brightwork thats in all the right places like the extra wide bumpers, faux vents in the hood, and the trim that outlines every inch of glass. Since this is a code-138 real-deal Super Sport, it has earned its correct badging on the front, rear, and fenders. Inside, Super Sport means bucket seats and a center console. The ivory color gives this a nice and fresh look, and it really showcases the intricate style on the seats and door panels. So family and friends will love getting inside. But no matter how many people are along, you know this one was built around the driver. You get classic elements like the grippy SS three-spoke steering wheel and long speedometer. This is joined by a full set of auxiliary gauges, and theres even an upgraded tach subtly added to the factory tach position. It all tells you theres something special under the hood even before you twist the key and hear it roar. The engine bay has the unmistakable look of serious performance, and it all looks so crisp because the consignor says theres less than 50 miles on the new drivetrain. Majestic Motorsports built this 496 cubic-inch stroker V8 setup. This big block has been enhanced and fortified with aluminum heads, roller cam, fabricated valve covers, Weiand performance intake, and topped with a Holley performance four-barrel carburetor. A set of Dougs headers adds even more power while also feeding the thunderous 3-inch dual exhaust. So you know this makes the right muscle car soundtrack. There theres all the right supporting components to get this power to the ground. That means a stout TH400 three-speed automatic transmission. It feeds a Moser rear end with 3.73 gears and Positraction. Plus, you have Ridetech suspension upgrades, power brakes w/discs up front, and sway bars front & rear. Theres over $30k invested in upgrading the drivetrain alone! So its the strong-running muscle machine youve been waiting for. Dont let it slip away, call today!